Fossil fungi are rare and such an exotic subject even for palaeobotanists that fossil collectors may be led to the assumption that it is no use looking for them. The enigmatic Prototaxites from the Silurian and Devonian, which comes in sizes of big tree trunks, has recently been interpreted by some as an enormous fungus (and as a rolled-up liverwort carpet by others) but is rather a nematophyte as assumed before. Putting aside that problematic fossil, not much is left that looks like Palaeozoic fungi, with a remarkable exception: Fungi are quite abundant in the Rhynie chert, which is famous for the good preservation of a waterlogged habitat from the Lower Devonian. Well, one needs a microscope to find them and to see in which way they had affected the living and decaying plants. 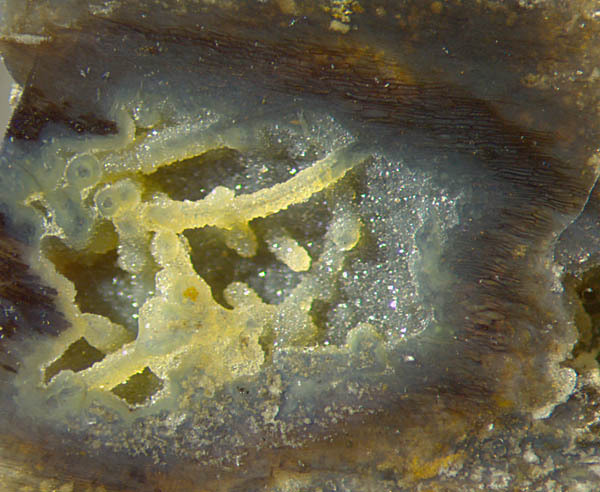 The delicate hyphae may be more easily spotted if they extend across a cavity, strengthened by a coating of chalcedony or quartz crystals (Fig.1). 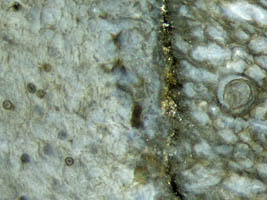 Fig.1: Inclined cut of a hollow straw of Aglaophyton with dark wall of preserved tissue and coated fungus hyphae traversing the cavity. Width of the image 4mm. The hyphae of the aquatic fungus had grown when the cavity was filled with water. Later they got a thick coating of chalcedony topped with quartz crystals. Note the hypha seen in full length through the translucent coating and others seen as tiny dark dots on cross-sections. Incidentally, other manifestations of the presence of fungi are seen within 3cm on the same cut face of the small chert sample of 120g where the coated hyphae have been found. Rather common are the thick-walled globules of about 0.35mm diameter, usually called chlamydospores, in decaying Aglaophyton in Fig.2 below left. Another fungus species is seen on the odd-shaped section in the centre. Its chlamydospores are comparatively tiny, with diameters of 0.05mm. Although the odd shape of the section is not important here, it may be explained: It is an inclined cut of Aglaophyton, non-cylindrical near a forking site, possibly slightly squeezed in addition to the natural asymmetry. Also not related to the fungus is the conspicuous crack on the left, formed in a state of advanced silicification when the response to strain was no more dominated by the plant tissue but by the mechanical parameters of the homogeneous silica gel. Later it became filled with a yellow deposit. A quite different phenomenon is seen on the right of Fig.2. With the exception of the conducting strand, the tissue seen on the cross-section is obviousy degraded in a particular way: Small voids have formed in the cortex which are so evenly distributed on average that they do not look like a result of random rot. They rather resemble the "flower-shaped" void patterns, a growth anomaly probably controlled by some fungus. The presence of a fungus in the cortex tissue in (Fig.3) is revealed by a globule, slightly shrunken now, which seems to fit into the mesh. It is not known whether or not it belongs to the fungus responsible for the patterning. Fig.2 (left): Aglaophyton sections of different aspect, with at least four different manifestations of fungus activity. Fig.3: Detail of Fig.2, boundary separating Aglaophyton axes affected by fungi in different ways. The fungus which reveals its presence by a characteristic dark fill of cells in a loose row, some of them collapsed, left of the vertical boundary in Fig.3, is easily recognized, with the help of , as the symbiotic fungus Glomites rhyniensis, which spreads in the live plant. The dark fills consist of so-called arbuscules, dense tangles of very thin branched hyphae engaged in symbiosis. The globose objects on the left, diameter 45-55µm, apparently correspond to what is called spores in  although their function is said to be uncertain. Those spores differ slighty from the present globules as they are "nearly elongate to globose and range from 50-80µm" . The suggestion that what is seen on the right of Fig.2 is a growth anomaly implies that another fungus species is able to occupy the live plant. This may be illustrated by images of "flower-shaped" void patterns from other samples, one of which is shown in Fig.4. An interpretation of similar voids as being due to mere shrinkage of decaying tissue  can be ruled out by the observation that there is healthy tissue adjoining to the voids. 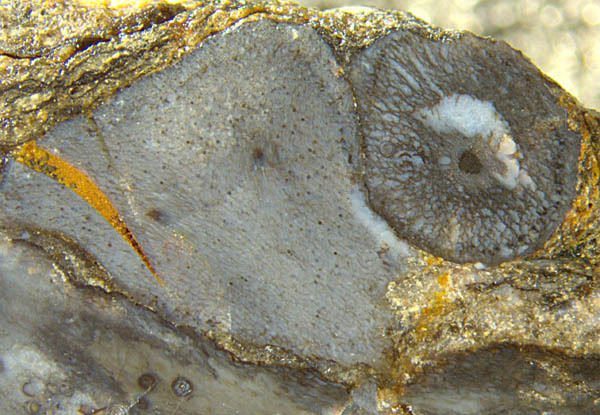 Other fossil evidence most probably indicating the presence of fungi in live plants is presented in Rhynie Chert News 54. 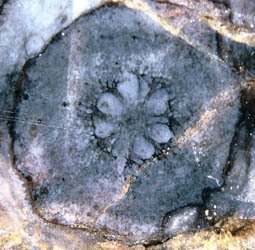 Fig.4 (right): "Flower-shaped" void pattern in Aglaophyton suggesting its formation by anomalous growth controlled by some fungus. Width of the section 3mm. It appears that fossil fungi from the Palaeozoic deserve due attention since they had been essential for the colonisation of the land by plants , and scientific work seems to cover only part of the intricate but fascinating subject [4,5]. T.N. Taylor, J.M. Osborn: The importance of fungi in shaping the paleoecosystem. H. Hass, T.N. Taylor, W. Remy: Fungi from the Lower Devonian Rhynie chert. Amer. J. Botany 81(1994), 29-37.